Have you ever craved pizza and Thai carry out? At the same time?…right, me too. Whether the idea of both sounds good or bad to you, I highly recommend at least trying this recipe. I know, I know – there is a version at that chain pizza place named after a West coast state’s kitchen, but I do believe this pie is so much better. I used a pizza dough that takes about 3 seconds to make, 2 1/2 hours to fully rise and be ready to use, and can be found on Smitten Kitchen’s site. Making the pie easier to assemble, I replace the tomato layer with a pre-made peanut sauce found at Whole Foods (365 Brand) in the Asian foods section. It’s absolutely delicious and not half bad for you. I’m sure there is a fairly easy recipe for the sauce, but since I make the pizza dough its one or the other on a work night. 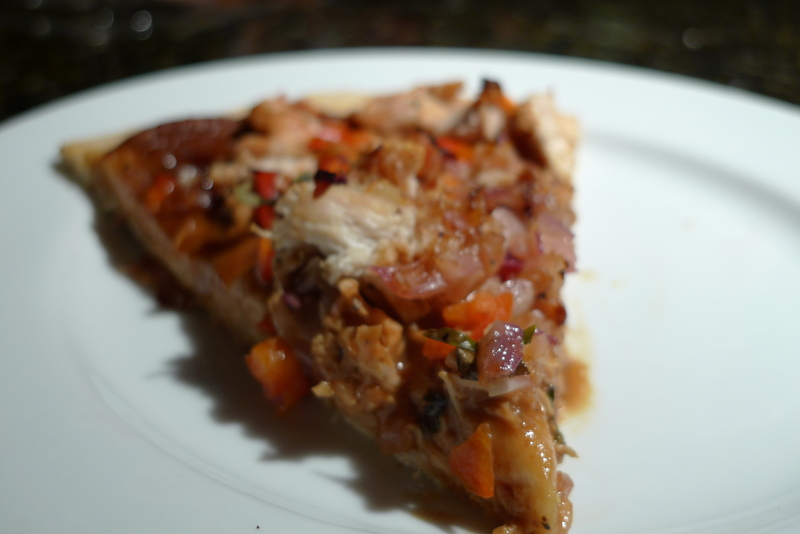 I dotted our pizza with finely diced red peppers, onions sautéed with some olive oil and garlic, a little diced chicken, fresh basil and red chili pepper flakes. Finish it off with a squeeze of lime and you’ll have a sweet, spicy, nutty and fresh pizza. Saute onions and garlic in olive oil until translucent – about 5 minutes. Set aside. Roll out pizza dough and place on pizza stone or baking sheet. Top with peanut sauce and layer with a drizzle of hoisin sauce. 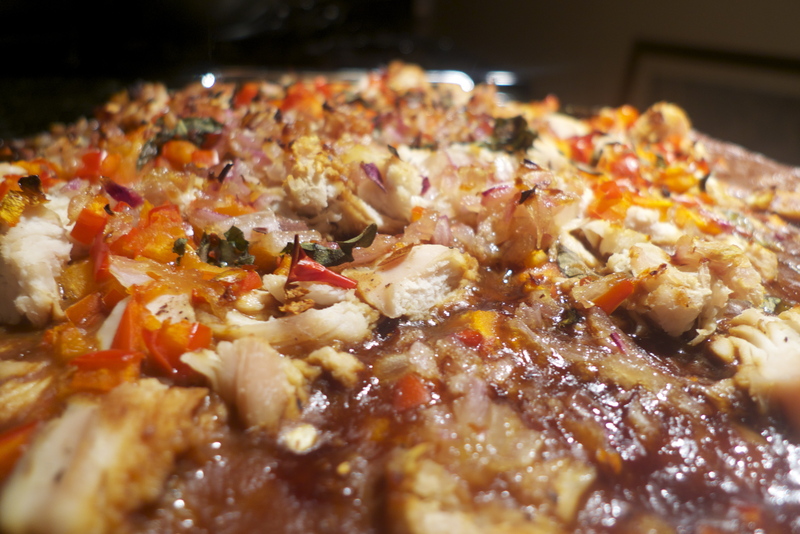 Top with diced chicken breast, red pepper, cooked onions and garlic mixture, and chopped basil. 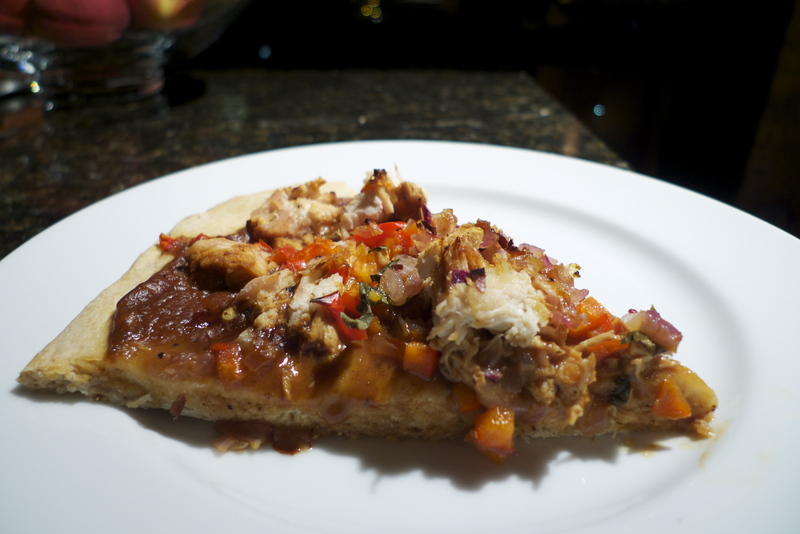 Sprinkle pizza with red chili pepper flakes to taste. Bake at 400 degrees for about 15 minutes or until crust is lightly golden. Squeeze a 1/2 lime or full lime over pizza before serving.